The early-bird sign up window for WOLT Place has ended. We’ll e-mail with more information after the New Year. In early 2019, We Only Look Thin will be moving to a subscription, membership-based, weight loss and weight maintenance accountability and support group for women, and we want you to join us as a founding member! This isn’t a Plan… this is a Place. You’ve already been a part of our monthly accountability group on Facebook, so you know that we’ve created a safe, judgement-free, place for daily support, check-ins, habit-based challenges, accountability, questions, grousing when weight loss is stupid, cheering when weight loss is awesome, candid vulnerability when everything seems to be falling apart, and comradery with women like you who are working hard to make themselves a priority. You can expect all that and more in 2019! We’re keeping WOLT Place small…. This will be a Place where you recognize everyone’s name and they know yours. Where if you don’t check in for a while, people notice. We notice. And we will stalk you a little. Where we get to know you as a person, not as a number, and help you work on the practice of managing your weight and your thoughts. We’ve been in other subscription based groups with over 1,000 members and found it was more like being an extra in the movie Ben Hur than being one of the stars in Steel Magnolias. This isn’t about getting lost in the crowd. This is about continuing a fellowship, trust and accountability with women working on themselves, just like you. 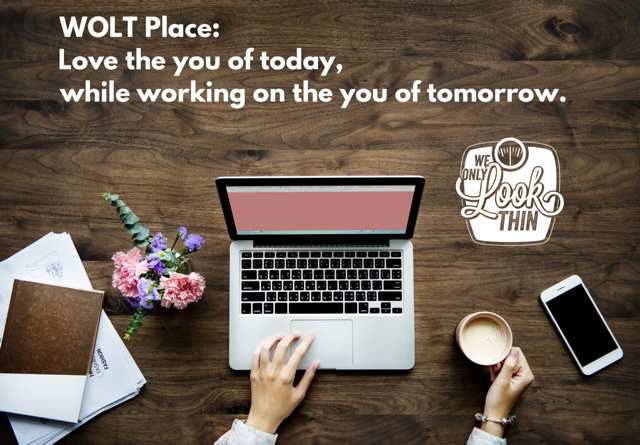 WOLT Place is your space to be exactly as you are today, while working on becoming the person you want to be. Does this sound like something you want in your life in 2019? Through December 4th, 2018, we will be offering access to Monthly Membership for current November “Fall into Habits” Members at $34.99 per month. After that date, we’ll be opening up the waiting list to new members at a rate of $39.99 per month, so please be sure to get on the list by December 4th! More details will follow, so if you’re interested in getting on our waiting list and learning more (with no obligation and no spam e-mails and no chain letters), please share your name and e-mail address below and we’ll send you more details when we’re ready to open our new and improved virtual doors. We don’t have a start date yet, but rest assured that we’ll continue our current group until we switch to the membership model. 3 years ago, we couldn’t have inspired a paper clip, so we want to thank you from the bottom of our thin-looking hearts for trusting us with your journeys / adventures / practices! Who’s thirsty for more?